Hello, and WELCOME to my stop on the Two Dark Reigns Blog Tour! I've been an ardent follower of the Three Dark Crowns series since the first book released and I was SO honoured when I got picked to be on this blog tour, hosted by Jean Book Nerd. 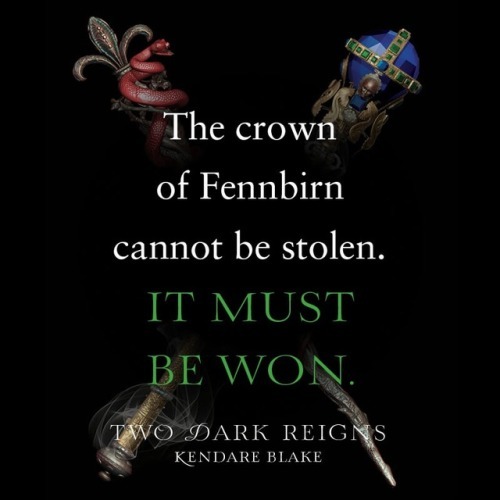 Blurb Description: #1 New York Times bestselling author Kendare Blake returns with the highly anticipated third book in the Three Dark Crowns series! Katharine sits on the throne, Mirabella and Arsinoe are in hiding, and an unexpected renegade is about to wage a war of her own. The crown has been won, but these queens are far from done. I always find it hard, going back into the Three Dark Crowns world. There have always been so many main characters and secondary characters and they keep growing with each book and well, I’M ONLY HUMAN, OKAY? What I mean to say is that it’s hard to remember all the character and all of their interconnecting stories without forgetting a few details with a year or so in between installments and well, it took me a while to really get into the book. 1. Two Dark Reigns is probably my FAVOURITE book in the series so far. While it started off with very fast chapters that kept me from connecting with all of the characters who landed up in so many different places at the end of Book 2, it ended in this COMPLETELY UNPREDICTABLE way and I absolutely loved it. 3. I really liked that what happened to Katharine was properly explained in this book. I didn’t understand it for all of book two, but I’m quite glad that it was better explained now. I loved Pietyr and Katharine’s relationship as well. It’s kind of adorable. 4. I loved how the Island and the queens of the past played such a big role in Two Dark Reigns. I loved the visions Arsinoe had of Illian, the Blue Queen and Daphne and IT WAS ALL JUST SO INTRIGUING AND I LOVED IT. 5. I quite liked Billy in this book, with his unwavering loyalty. He always seemed fickle to me in the previous two instalments and I didn’t think much of him until Two Dark Reigns. I love that we got to see the ‘human’ world in this book with all of its ‘rules’ and I love that Arsinoe rebelled against the convention of what it meant to be ‘proper’ here. 6. I started off this series with Jules being my favourite character, that I thought deserved to be queen, but I LOVE THAT ALL THE CHARACTERS HAVE GROWN SO MUCH AND NOW I DON’T KNOW WHO WILL SIT ON THE THRONE AT THE END OF THE DAY? I’m loving the intrigue, though! Would I recommend this series? OF COURSE! YA Fantasy is my favourite genre and this series has really managed to surprise me, Two Dark Reigns in particular. 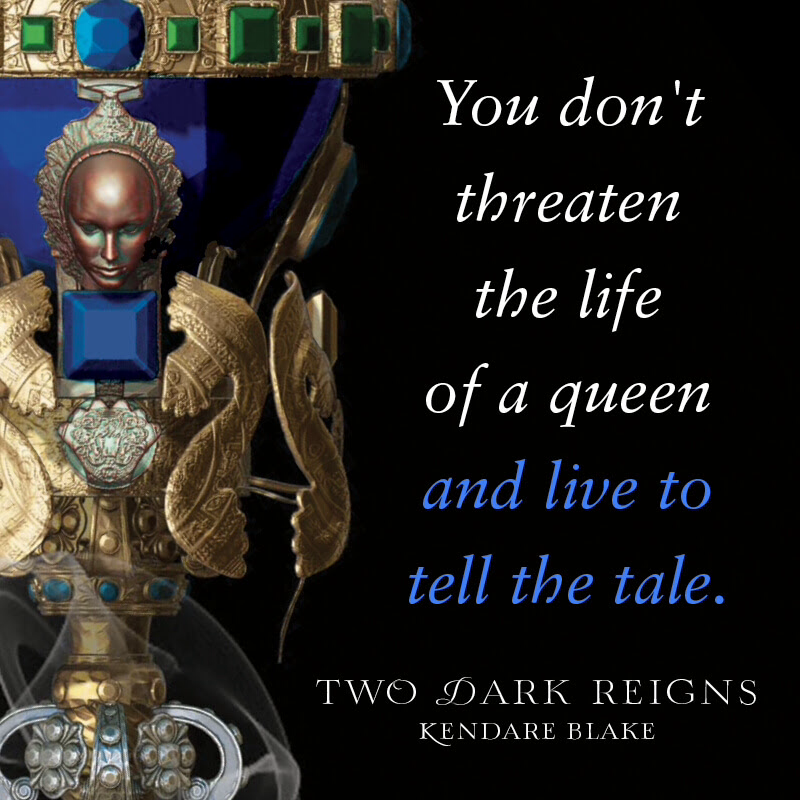 - 2 Winners will receive a Copy of I Winner will receive a Copy of TWO DARK REIGNS by Kendare Blake.